Hardy Diagnostics has a very proactive R&D department that is continually looking for a better way to culture and identify pathogenic organisms. We collaborate with numerous outside laboratories to thoroughly test our innovative new products. To view video demo of selected products click here . Below we have listed some recent posters that have been presented at various national ASM conventions. 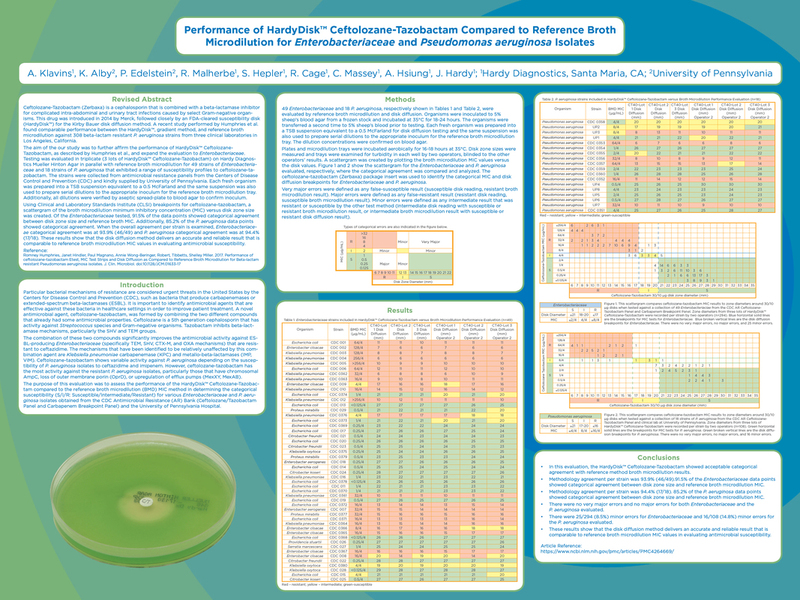 Performance of HardyDisk Ceftolozane-Tazobactam Compared to Reference Broth Microdilution for Enterobacteriaceae and Pseudomonas aeruginosa Isolates. AnaeroGRO™ media demonstrated superior performance for all strains tested on Brucella, BBE, and LKV. In-house testing and clinical trials demonstrated that BluEcoli™ can accurately detect E. coli without having to do further confirmatory testing. BluEcoli™ demonstrated 100% sensitivity and 100% specificity in both evaluations. Describes the evaluation of CarboFerm™ – a carbohydrate utilization test system for the identification of Neisseria and Moraxella spp . The test system performed well for the identification of N. gonorrhoeae , N. meningitidis and M. catarrhalis . Further testing may be required for N. lactamica and Neisseria spp. The study confirmed the Dye Tolerance media as a reliable and convenient method for the speciation of Brucella spp . An article describing the use of a single-tube reaction system for the differentiation of non-pathogenic and pathogenic Enterobacteriaceae. Evaluation of HardyCHROM ESBL as a detection method of ESBL-producing Escherichia coli, Klebsiella pneumoniae, and Klebsiella oxytoca: a multi-centric study. 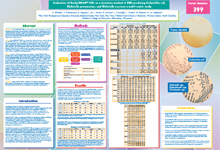 The study concludes that HardyCHROM ESBL can be reliably employed as an initial screen for patients harboring Enterobacteriaceae conferring resistance to extended spectrum beta lactamases and 3rd generation cephalosporins. The study compared disk diffusion testing of voriconazole mold isolates using 1 and 10ug disks and two media, Mueller Hinton with Glucose and Methylene Blue and standard Mueller Hinton plates. Results of this evaluation support the usage of more GBS specific products in lieu of subculture to blood agar. StrepB carrot broth is a chromogenic enrichment broth that can directly detect hemolytic GBS isolates. Carrot broth reliably detects beta hemolytic GBS in 16-24 hours. Based on the results of this study, GBS Detect™ is a reliable method to increase the sensitivity of traditional culture methods for GBS detection, especially for non-beta hemolytic strains. 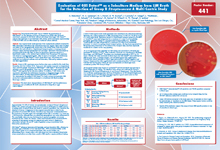 Evaluation of GBS Detect™: A New Medium for the Detection of Non-Hemolytic Group B Strep in Subcultures of Carrot Broth™ and LIM Broth. A new medium, GBS Detect™, was evaluated in a multi-center trial in comparison to Blood Agar plates. Over 22% of the GBS isolates were detected only on GBS Detect™, because these strains were non-hemolytic on standard Blood Agar plates. Evaluation of GBS Detect™ and ChromID Strepto B agars for the detection of Group B streptococcus from GBS Screening Broth Medium (GBS). Hardy Diagnostics GBS Detect media is the most reliable selective media for the detection of GBS when using the CDC culture algorithm. Comparison of Four Media for the Detection of Group A Streptococcus from Throat Specimens. Hardy’s GBS Detect agar detected the most (90%) isolates after 24 hours. 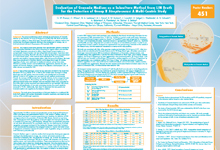 Evaluation of Granada Medium as a Subculture Method from LIM Broth for the Detection of Group B Streptococcus: A Multi-Centric Study. Granada Medium demonstrated 96.7% sensitivity and 98.4% specificity compared to the reference method based on color reaction alone. Sensitivity of Granada Medium was enhanced to 99.2% upon latex confirmation of non-hemolytic Group B Strep strains (white colonies on Granada). Ten strains of beta hemolytic GBS were undetected by LIM-BAP while these were recovered by the LIM-Granada agar. HardyCHROM™ Candida performed better than BD CHROMagar™ with larger colony size and better color development. HardyCHROM™ Candida was found to be an easy, reliable, and accurate method for identifying clinically significant yeasts. The accurate identification of MRSA positive wound swabs was found to be more reliable on the HardyCHROM™ MRSA media within 24 hours in comparison with BBL™ CHROMagar™ MRSA media. HardyCHROM™ MRSA was found to be more reliable and had a faster detection time when compared to BBL CHROMagar™ MRSA. Bio-Rad MRSASelect and HardyCHROM MRSA accurately detect MRSA isolates from nasal swab specimens. HardyCHROM MRSA performs reliably at 24 hours, and is actually more accurate than a 48 hour interpretation. In our laboratory, visual clarity of the Hardy media was much preferred compared to the Bio-Rad product. Evaluation of a Novel Chromogenic Medium for the Isolation and Differentiation of Salmonella and Shigella spp. Based on these findings, HardyCHROM SS can be employed as a replacement for MacConkey Agar and Hektoen Enteric Agar, as well as TSI and LIA screens from these media. HardyCHROM SS is a reliable and economical method for the selective isolation and differentiation of Salmonella and Shigella spp. from non-pathogenic enteric bacteria. HardyCHROM™ UTI proved to be an accurate and reliable primary medium for the differentiation and identification of common UTI pathogens found in urine specimens. These media allow for reliable recovery of ciprofloxacin-resistant enteric gram-negative organisms that can be introduced into the blood stream during prostate biopsy procedures. Evaluation of a new formulation of Malt Extract Agar that resulted in more restricted colonies and better sporulation. The average colony size on the selective side of the HDx plate was larger than the average colony size on the selective side of the BD plate. Evaluation of Rapid Methyl-Alpha-D-Glucopyranoside Medium (MGP) for the Differentiation of Vancomycin Resistant Enterococci . Rapid MGP Medium is a reliable means to differentiate E. faecalis and E. faecium from E. gallinarum and E. casseliflavus. The sensitivity was 96%, with a specificity of 100%. Rapid Urease Medium is more cost effective and has a faster reaction time as compared to the standard CLO test. StrepB Carrot Broth™ revealed the best performance among the three culture media in this evaluation. 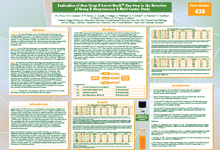 Carrot Broth™ demonstrated higher sensitivity when compared to another GBS broth. Compared to conventional testing for GBS, using Strep B Carrot Broth™ demonstrated increased sensitivity and specificity with a marked reduction in turnaround time. Diagnostic efficiency was increased with the use of Carrot Broth™ over LIM broth, because of the color change seen with positive samples. Testing negative Carrot Broth™ by PCR resulted in a higher percentage of positives than when LIM was used for PCR testing. Carrot broth culture using the BD GeneOhm™ StrepB assay (carrot broth enhanced PCR) yields increased sensitivity over carrot broth culture for detection of Streptococcus agalactiae . Optimal results were obtained when using Carrot Broth™ for processing specimens for Group B Streptococcus . A study was conducted to determine survival of Group B Streptococcus in Carrot Broth™ and LIM Broth. The survival ranged was between 15-113 days in Carrot Broth™, with a mean of 51 days. Overall, the recovery from Carrot Broth™ stored at room temperature was better than with LIM broth stored under the same conditions. Carrot Broth™ was compared to two other commercial broth media with similar recovery noted for all three products, except when the count was less than 10 -3 Recovery was better with Carrot Broth™ and Granada Instant Broth Biphasic when the CFU was lower. Study showed that Carrot Broth™ performed better than Group B Strep Broth(NEL). Reference strains were tested using Carrot Broth™ and showed 100% sensitivity and specificity for all hemolytic strains tested. This study showed that Carrot Broth™ was more sensitive than LIM Broth and also that Carrot Broth™ showed better sensitivity than primary testing with the IDI-Strep BTM SmartCycler®. Evaluation of StrepB Carrot Broth™ and LIM Broth Methods for Recovery of Group B Streptococci (GBS). Results of a multi-center trial comparing LIM Broth to Carrot Broth™. Carrot Broth™ demonstrated higher sensitivity and specificity than the LIM Broth method. 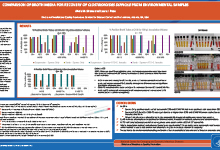 This study compared three media used for the isolation of GBS. In cases where the colony count was low, Carrot Broth™ was able to reliably detect GBS. This study demonstrates that Carrot Broth One Step is equivalent in performance to the original Carrot Broth Kit, and is superior in testing due to no tile requirements, thus reducing specimen processing time. I want to take a minute and let you know that you guys are doing a terrific job fulfilling my requests no matter how small they are or what time I make them. Thank You!